Amazon Price: EUR 22,50 EUR 22,50 (as of 12. February 2019 14:15 – Details). Product prices and availability are accurate as of the date/time indicated and are subject to change. Any price and availability information displayed on the Amazon site at the time of purchase will apply to the purchase of this product. Beater can be rotated using the knob on the top. 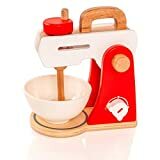 The bowl can be removed by lifting the handle on the top of the mixer., Beautifully crafted and painted in a comtemporary red, white and natural design, Size: 210 mm x 195 mm x 110 mm, Part of a set of Viga kitchen accessories suitable for stand alone play or to complement the various Viga Kitchens., Safety: All Viga toys are made with non-toxic paints & inks and comply with EN71 & ASTM toy standards.